BEGNEAUD skillfully designs, produces, and assembles its own line of custom laser cut, etched, and punched art and awards. From oil field parts to ceiling tiles to custom art pieces, BEGNEAUD specializes in fast and efficient punch capabilities for any industry. 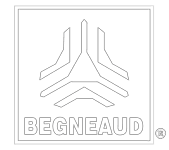 BEGNEAUD applies its innovative approach to address client projects, as well as internal processes, leveraging top-of-the line technology to create value added products and services. BEGNEAUD prides itself on outstanding customer service and quality production for every client project, every time.